Editor's Note: This blog post was originally written by Jesse Eaves, Humanity United Director of Policy and Government Relations, and originally appeared on the Humanity United website, March 2, 2015. When talking about war in the Democratic Republic of Congo (DRC), it’s easy to want to look away. For the past 18 months, former Senator Russell Feingold has served as the Special Envoy for the Great Lakes Region and the Democratic Republic of Congo. During that time, he and his staff worked tirelessly to make sure the U.S. government and its partners in Africa addressed some of the biggest and urgent challenges facing DRC and the entire region. Now, Special Envoy Feingold has stepped down from his position, leaving some very big shoes to fill. During his time as Special Envoy, Senator Feingold helped bring about several positive developments for peace in the region. He helped unite regional governments to bring an end of the M23 rebel group, which waged a campaign of violence and terror across eastern DRC. He emphasized the need for accountability of those who commit atrocities and mas violence against civilians. And he worked with international and regional leaders to start honest discussions and encourage real efforts to have stable, democratic transitions of power. Last week, in his final speech as Special Envoy, Senator Feingold talked about why engagement with this vital region of Africa is so essential. That engagement must continue with little delay. Today, 22 organizations and individuals who both work in and advocate for stability, peace, and prosperity in the DRC and the entire Great Lakes Region of Africa signed a letter to Secretary of State John Kerry asking him to appoint a new, high-level Special Envoy to continue the great work of Senator Feingold and seize advantage of the momentum that has been generated through U.S. engagement in this region of the world. To break stride and look away now would be a huge blow for security, peace, and stability in this region that has seen little of each for a long time. Read the sign on letter here. 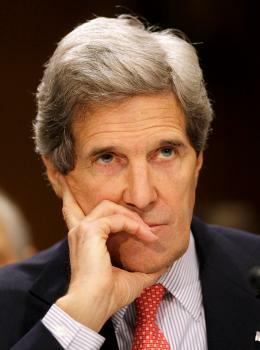 Photo: Secretary of State John Kerry (AP).